English: Common crossbill; French: Bec-croisé des sapins; German: Fichtenkreuzschnabel; Spanish: Piquituerto Común. The red crossbill has a body length of about 5.5 in (14 cm) and weighs about 1.4 oz (40 g). It has a rather heavy body, a short forked tail, and a stout beak in which the tips of the upper and lower mandibles cross over as an adaptation to extracting seeds from conifer cones. Males are colored overall brick-red, with blackish wings and tail. Females are a dull yellow-brown with darker wings. Juveniles have weakly crossed mandibles, gray-olive upperparts and whitish underparts both streaked with dark brown, and a buff-yellow rump. 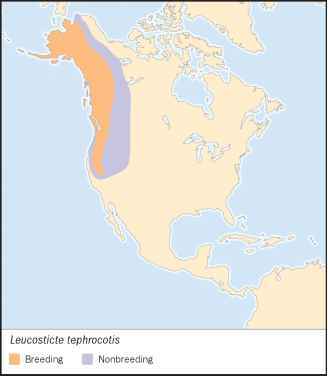 The red crossbill is an extremely widespread species that inhabits the boreal and montane forest regions of both North America and Eurasia. It occurs from coast to coast in suitable habitats on both continents. It periodically irrupts from its usual wintering regions and may then be abundant in areas where it is not usually seen. 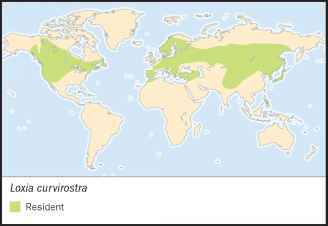 Red crossbills breed and winter in pine-containing conifer forests of various kinds. Red crossbills are highly social birds, especially during the non-breeding season when they may occur in large flocks. The territorial song is a repeated series of simple chirps, often given in flight. The male displays to the female by flying above her, vibrating his wings, and delivering an in-flight song. Red crossbills feed on the seeds of conifers, particularly species of pines. They use their peculiar, crossed bill to force the scales of conifer cones apart and then scoop the seed into their mouths with their tongues. Their diet also includes insects and caterpillars. Breeding pairs are monogamous and solitary. The female builds a cup-shaped nest of twigs, bark, grass, and rootlets, lined with finer grasses, feathers, fur, hair, and moss. The nest is located on a tree branch far out from the trunk about 6.6-40 ft (2-12 m) above the ground. A clutch of three to four light green or blue eggs spotted with brown and lilac is incubated by the female for 12-18 days. The altricial young are brooded by the female and fed by both parents. They fledge in 15-20 days. Nestlings have straight mandibles that cross gradually after they have been out of the nest for about three weeks. One to two broods per year. Not threatened. The red crossbill is a widespread and abundant species. Some populations, however, have declined greatly and are considered to be at risk. The subspecies native to the island of Newfoundland, for example, has become extremely rare. Logging operations have destroyed and continue to damage red crossbill habitat. French: Roselin à tête grise; German: Rosenbauch-Schneegimpel; Spanish: Pinzon Rosado de Corona Gris. 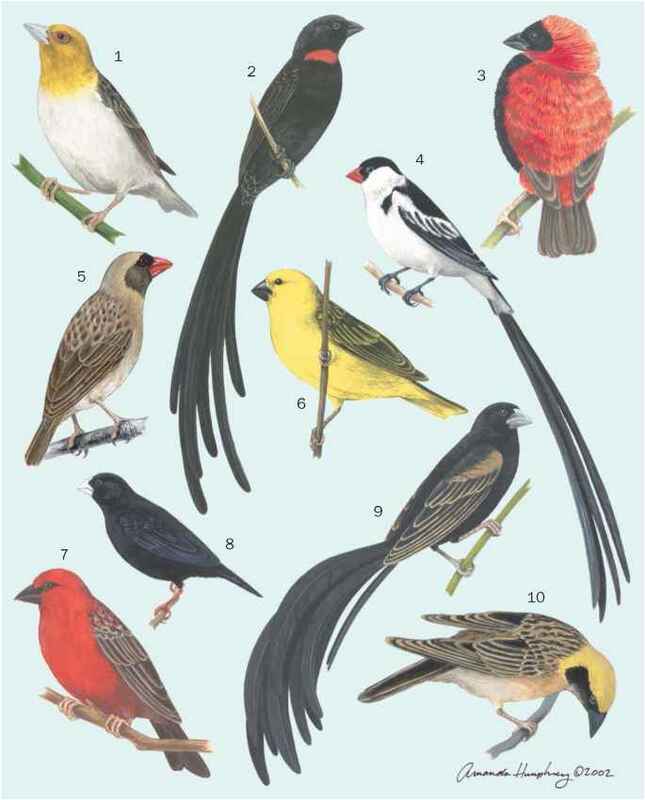 The gray-crowned rosy finch has a body length of about 6.5 in (16.5 cm). It has a short, slightly forked tail, and a stout, conical, pointed beak. The male is colored overall red, with pinkish red patches on the wings, a dark tail, a gray head, and black patches on the face. The female has a browner, more subdued body coloration, and lacks a black patch on the chin. Juveniles are gray-brown. The gray-crowned rosy finch occurs in the Rocky Mountain region and western Arctic tundra of North America, ranging from Alaska, through western Canada, to the southwestern United States. It breeds in higher-altitude habitats and winters in lower altitudes. The gray-crowned rosy finch breeds in alpine tundra above the timberline, and also in northern tundra in Alaska and Yukon. It winters in lowlands, including open habitats and conifer forest. Gray-crowned rosy finches are rather tame and unafraid of humans. They are social birds, especially during the non-breeding season when they occur in flocks. Males are weakly territorial and the song is a repeated series of simple, high-pitched chirps, often given in flight. Gray-crowned rosy finches feed on seeds of various kinds, supplemented by invertebrates. They forage on ripe herbaceous plants and also on the ground and in snowbanks.